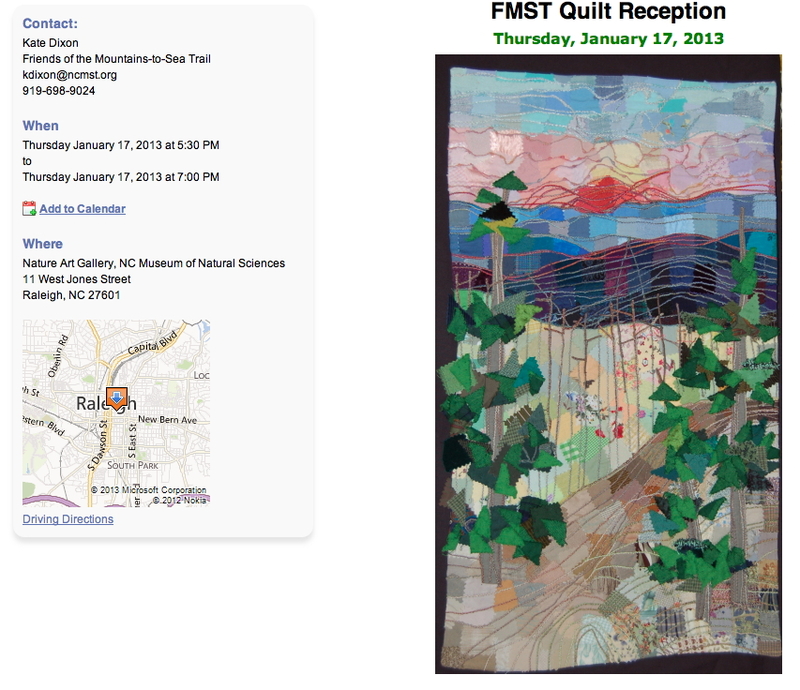 The Nature Art Gallery at the North Carolina Museum of Sciences is exhibiting the Mountain to Sea Quilt panels through January 27. 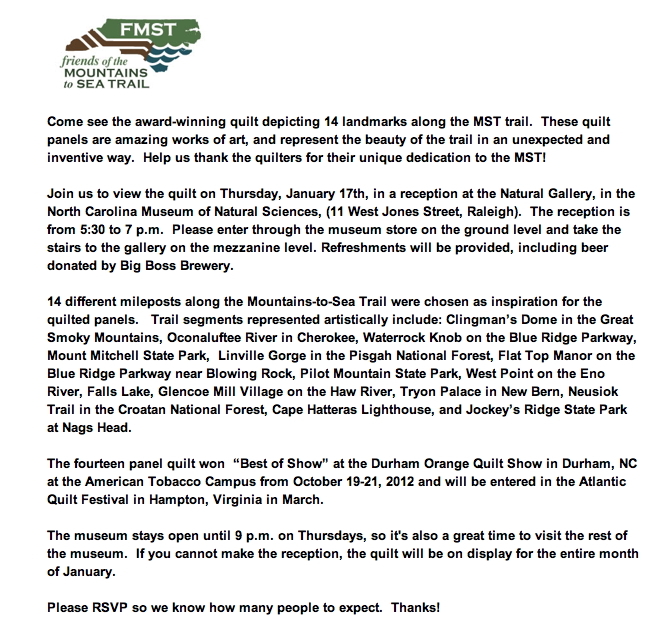 Last night the Friends of the Mountain to Sea Trail hosted the artists with a reception at the gallery. 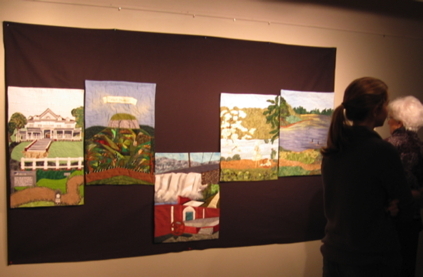 We cannot publish pictures of the panels yet as we have applied to participate in the Mid-Atlantic Quilt Festival in Hampton, VA in February, and must keep the quilts under wraps a bit until after the judging. 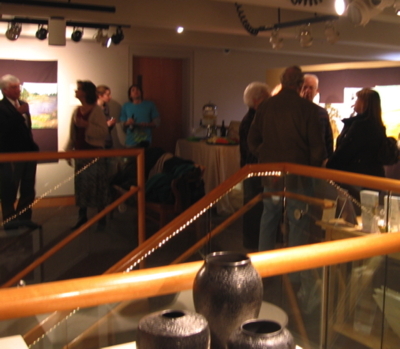 Here are some photos of the reception last night which was well attended, even though the first snowfall of the season was on its way. 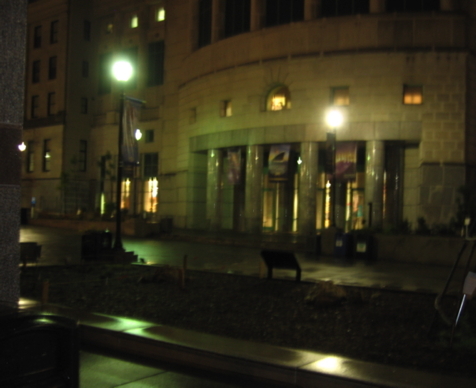 Luckily the snow held off until after the reception, giving most attendees enough time to get home and snuggle in. A good crowd despite rain and snow. 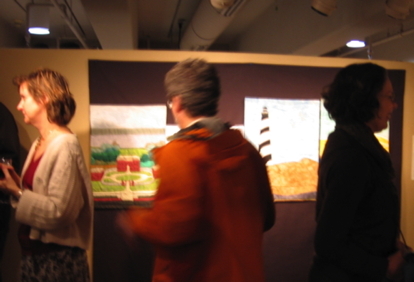 More artists are sharing their weekly project at Off the Wall Friday! Check them out, too. This entry was posted in Copyright© 2009 All images and text in all categories are copyright of Mary A. Ritter (aka M'Unique) and may not be reproduced without express permission., Durham Orange Quilters, Fiber Arts and tagged Clingman's Dome, MAQF, Mid Atlantic Quilt Festival, Mountain to Sea Trail, NC, North Carolina Museum of Natural Sciences, Raleigh, The Moses Cone Flat Top Manor, The Nature Art Gallery. Bookmark the permalink.